BOSTON -- After 892 career games, defenseman Zdeno Chara netted his first career hat trick today in the Bruins 7-0 win over the Carolina Hurricanes. "It’s a very humble feeling and mostly a happy feeling," Chara said. "But you know, when I look at it, some of the greatest players, for example [Detroit Red Wings defenseman] Nicklas Lidstrom just got his [first career hat trick] after 1300-1400 games. "Obviously, a big 'Thank You' goes to the guys, because they put me in good spots and positions that I could actually take shots and score," he said. The B’s captain netted two of the goals in the first period and finished the trick in the third. “It’s well deserved… those were three good goals," Bruins netminder Tim Thomas said after the game. "I’m liking where his shot’s at and the positions he’s getting himself in to take those shots the past few games, and it’s paying off. “So I’m very happy for him. He got two early, and I was hoping he’d get that third. "Of course nobody wanted to say anything. It’s kinda like (a) shut out; you don’t say it, but I was very happy when he actually…he finished that hat trick off,” he said. Forward Shawn Thornton agreed that the team didn’t want to jinx Chara in-between periods by saying anything to him. “Yeah, everyone talked about it without talking about it too much I guess. But anytime somebody’s got two you really want to see them succeed and get the third one. It’s a great feeling, it’s his first career one and he’s been in the league for fourteen years,” Thornton said. 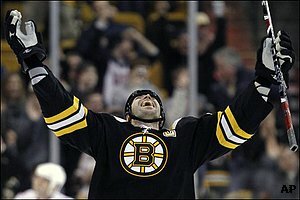 Chara had two, two-goal games in the 05-06 campaign and the 08-09 season but wasn’t able to tally a three-goal effort until today’s game. “I wasn’t really thinking about scoring the third goal, I was just trying to make the right play and obviously if something else is open I’m going to pass the puck,” he said. Chara’s three goals marked the fourth time a Bruins defenseman has netted the hat trick. “It was great. It’s not too often that you see a defenseman getting a hat trick. We all saw he was excited about it. He has that great shot, he was able to chip in this year with a bunch of goals," said Bruins left-winger Milan Lucic.